Our home is welcome to all individuals, regardless of religion or beliefs. Our core values of Love, Compassion, Respect, Hospitality, Justice and Patience are at the heart of our service. Sisters within our community can offer pastoral support where requested. 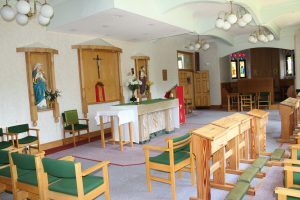 Our home offers a daily mass for both residents and the local community and we also have visiting ministers from other faiths, which provides inclusive spiritual diversity.